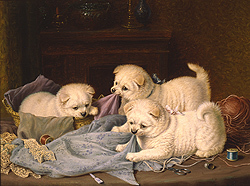 Couldery was a Victorian artist who specialized in painting cats and dogs. He lived in Lewisham, Kent and was a member of a large family of artists – five in all. Although an artist, his father had second thoughts as to Horatio’s profession and subsequently placed him in apprenticeship with a cabinet maker. However, his love for art soon won out and at the age of 25 he enrolled in the Royal Academy Schools; exhibiting his first work there in 1864. 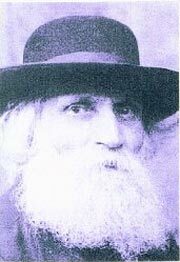 During his day, he was a popular artist and exhibited works in many of the important exhibition halls, including the Royal Academy; Royal Society of British Artists; British Institution and at the Graphic Exhibition of Animal Paintings in 1882. 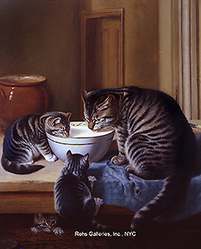 In 1875 Couldery exhibited A Fascinating Tail at the Royal Academy. In the Academy Notes, John Ruskin had the following comments: quite the most skillful, minute, and Dureresque painting in the Exhibition, not to be seen without a lens: - and in its sympathy with kitten nature … and its tact and sensitivity to the finest gradations of kittenly meditation and motion, - unsurpassable. Today examples of Couldery’s work can be seen in the collections of the Norwich Art Gallery and the Nottingham Art Gallery.